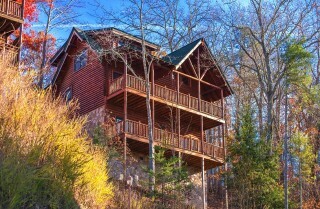 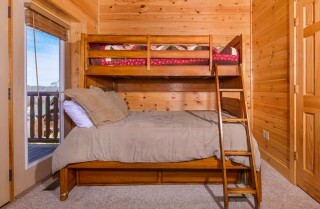 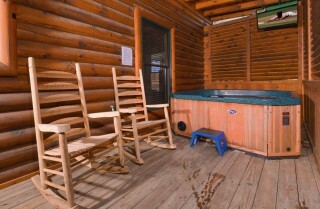 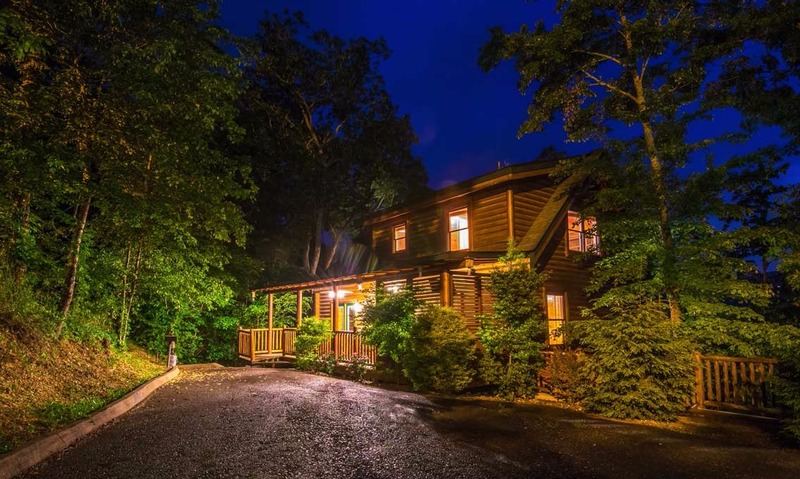 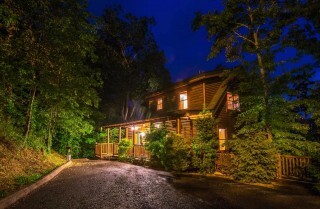 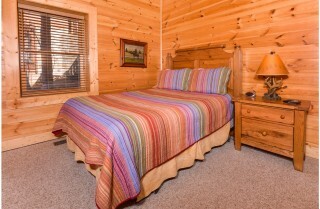 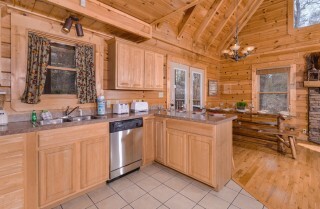 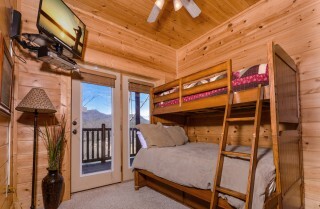 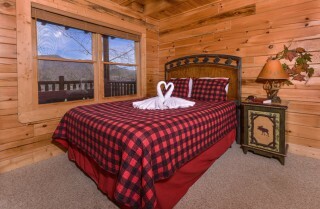 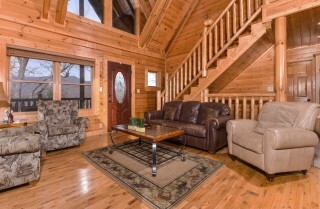 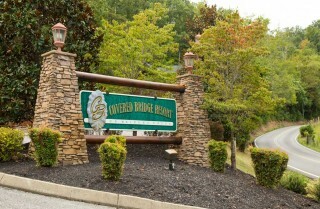 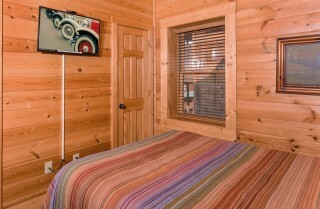 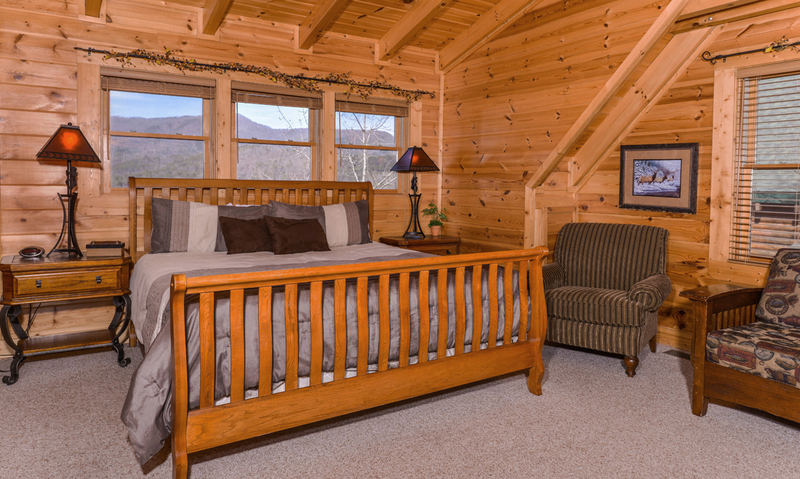 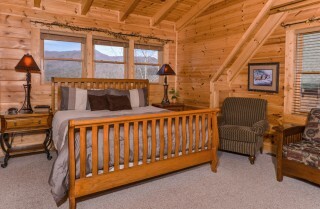 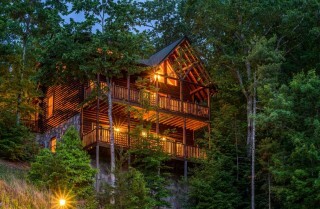 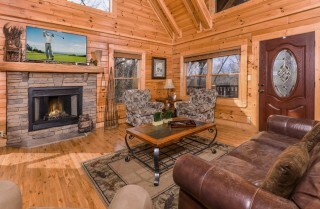 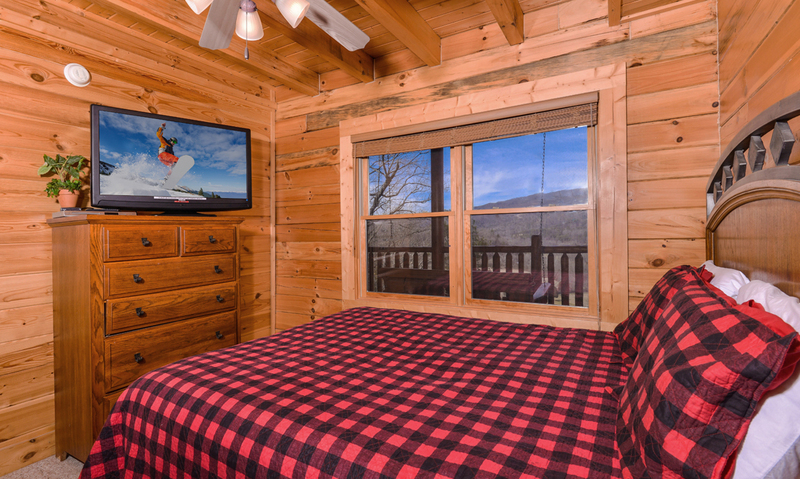 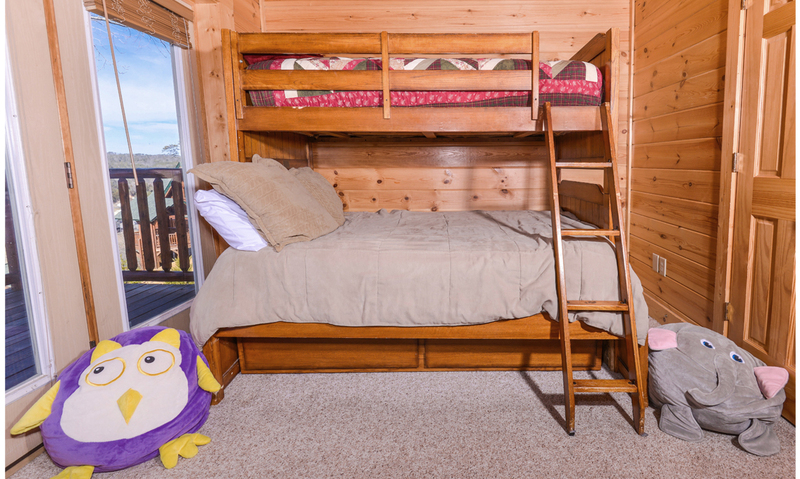 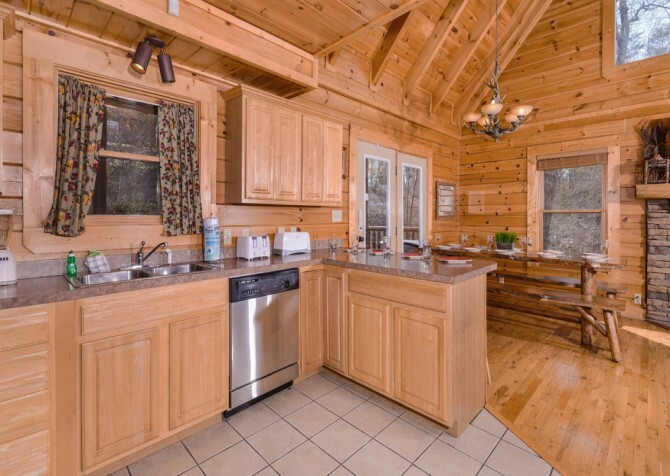 Searching for the ideal group cabin for your Smoky Mountain vacation? Well, your search stops here! 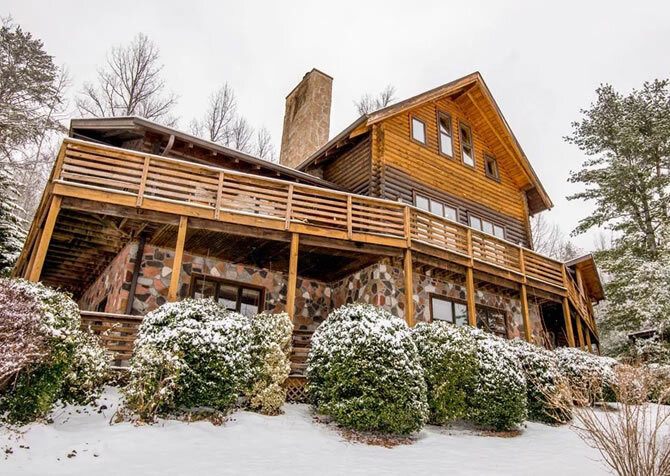 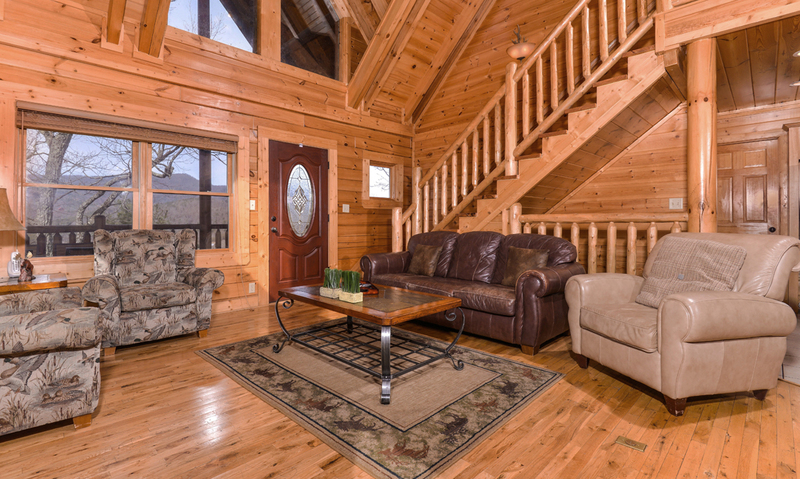 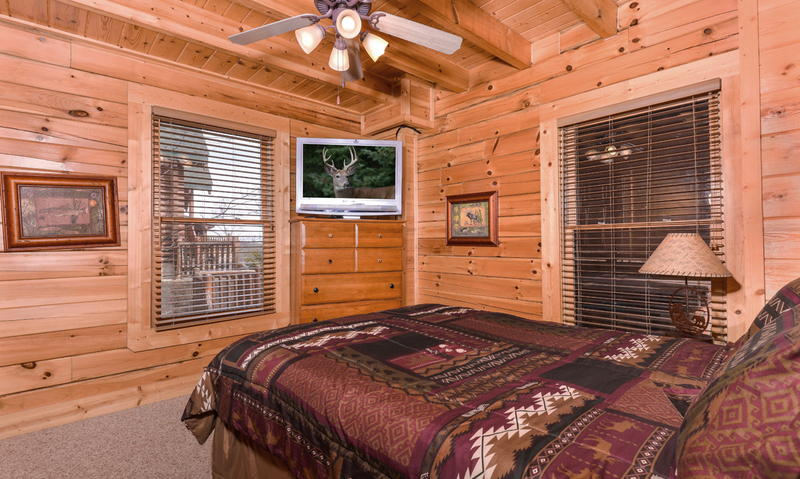 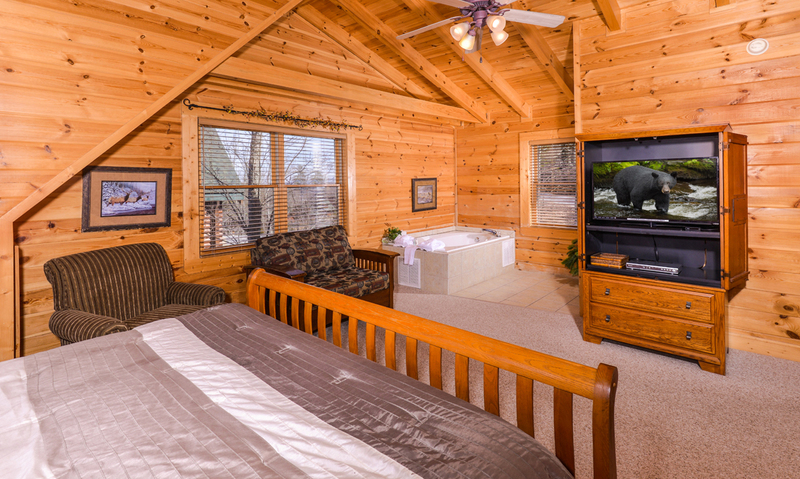 Papa Bear Lodge is a beautiful 5-bedroom, 4-bathroom, 3-story lodge in Pigeon Forge, Tennessee, that not only offers plenty of space for up to 16 guests at 2,400 square feet but also provides bonus amenities for all to enjoy. 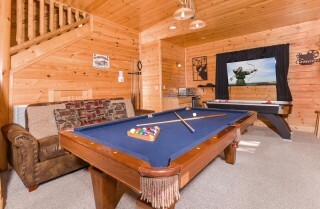 Dine every evening with gorgeous mountain views, watch feature films on the 65-inch flatscreen TV, play air hockey and arcade games in the rec room, unwind in the hot tub with a comedy show on the outdoor TV, curl up by the fire with your favorite novel, and drift to dreamland in the master suite’s king-size bed after a soothing spa bath in the indoor jetted tub. 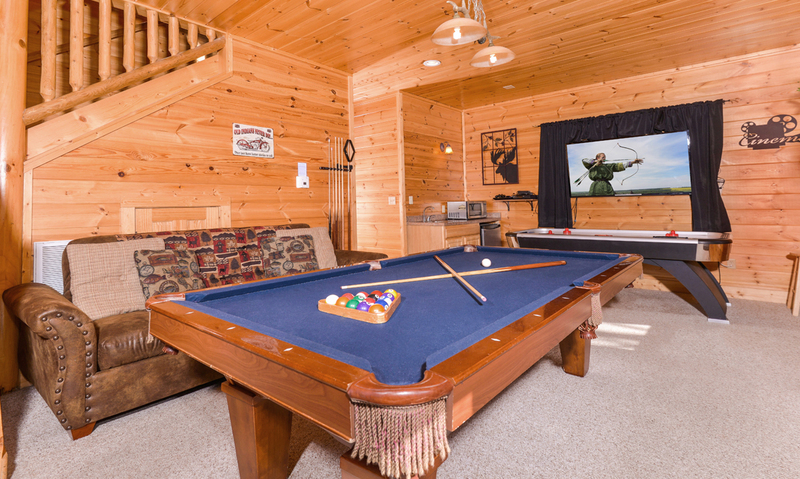 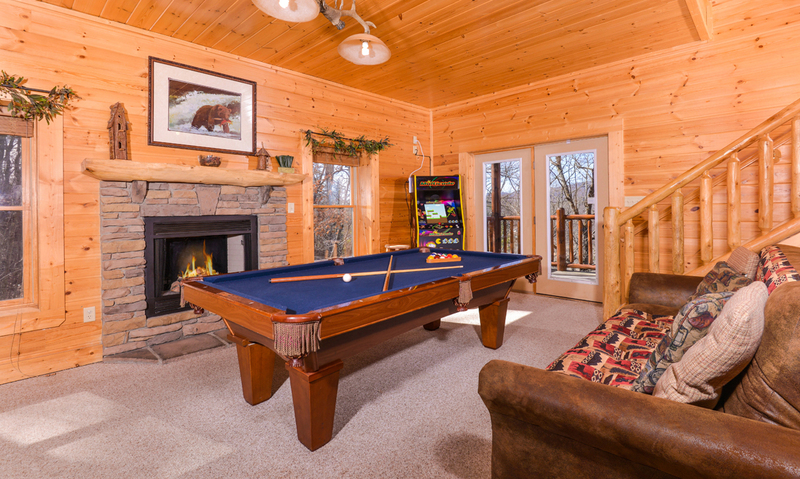 The perfect place to have fun and relax with family, friends, coworkers, or teammates, Papa Bear Lodge is a true mountain paradise — don’t miss your opportunity to enjoy memorable Smoky Mountain experiences at this large-group cabin in the Smokies! Kick back and relax in the spacious living room at Papa Bear Lodge, featuring a comfy couch, 3 cozy arm chairs, a big screen TV, and a stone-bordered, electric (no heat) fireplace. Flip on the TV with snacks piled high on the coffee table or settle in for a romantic novel by the fireplace in the corner reading nook. 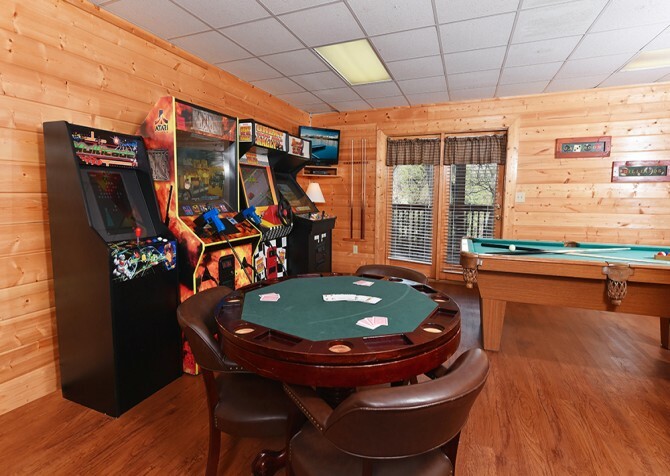 Great for spending quality time with family and friends, the living room is perfect for playing a game of cards, piecing a puzzle together, or curling up on the sofa for a juicy chat. 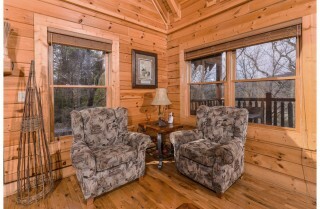 Plus, with plenty of natural light pouring in through the large windows, this space will feel warm and inviting. 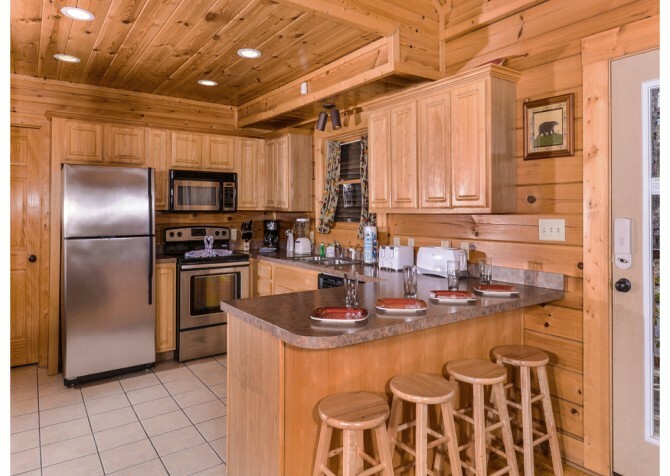 Boasting an open floorplan throughout the home, the fully equipped kitchen at Papa Bear Lodge is mere feet away from the living space, which allows you to keep conversations going while preparing homemade meals or refilling cold drinks. With ample counter space and bar seating for 4, helping hands won’t be far away when dinner rolls around. 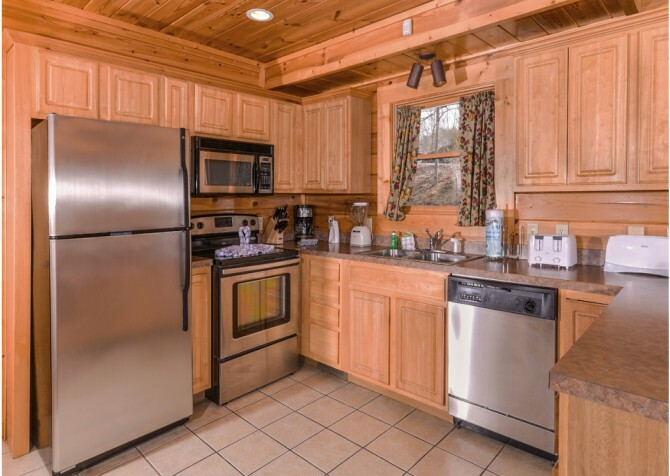 Add the stainless-steel appliances (refrigerator, microwave, stove, dishwasher, and coffeemaker), pots and pans, silverware, mugs, and more, and you have a space ready for gourmet dishes and late-night snacks. No matter the time of day, this kitchen is ready to serve you and your guests! 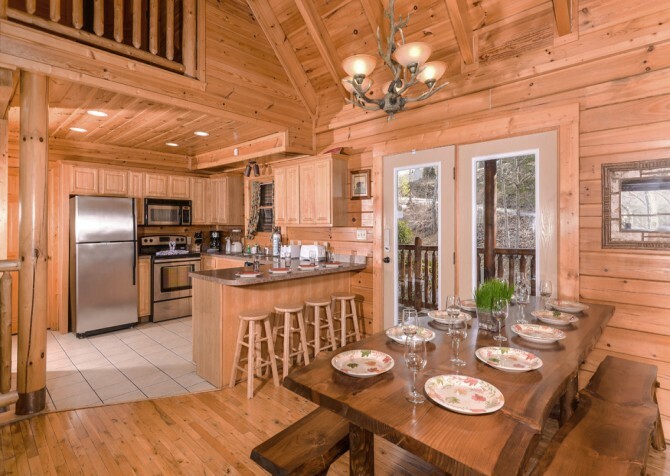 Right by the kitchen is the large dining room table with natural wood features and long benches for ample seating. 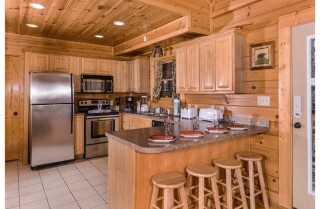 Throw in the kitchen bar and living space, and everyone will have a comfortable place to sit for every meal. There’s even a dining area on the nearby deck for extra space, perfect for morning coffee with a mountain view. 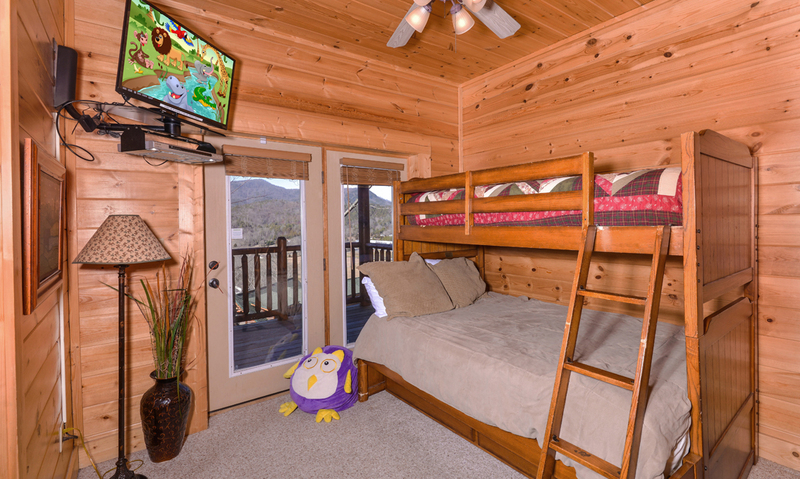 When food time is over, pull out your laptop to check out local events on our Cabins for YOU blog or clear the space for arts and crafts with the kids. 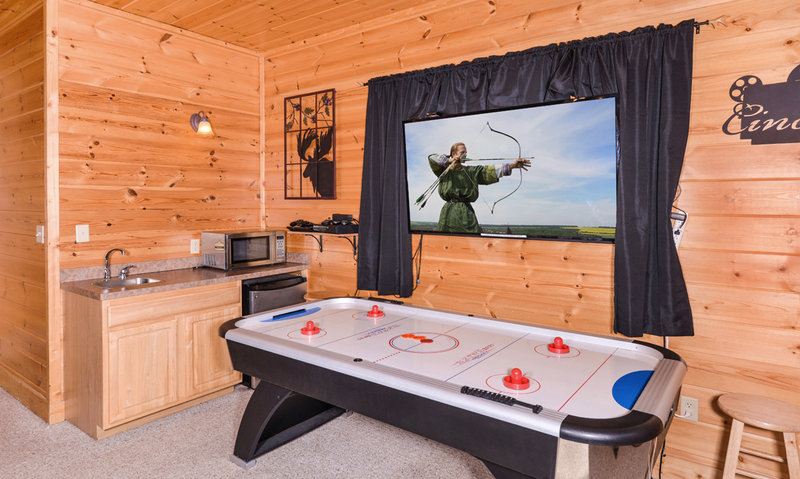 Ready to take on the whole gang in an epic game battle? 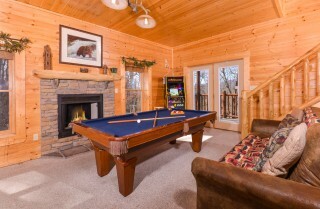 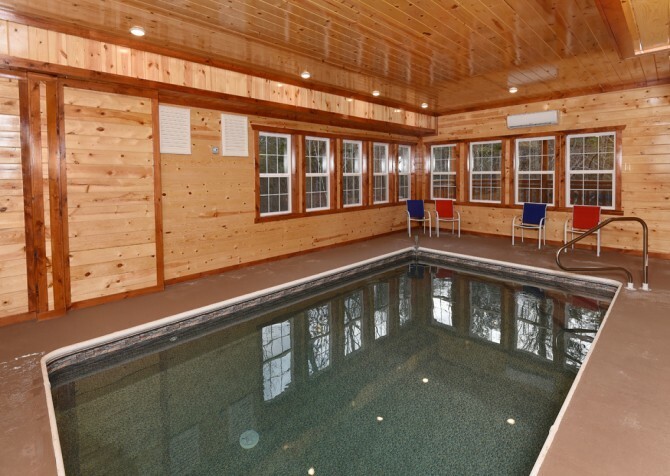 Papa Bear Lodge gets it, which is why a fully loaded rec room awaits downstairs. 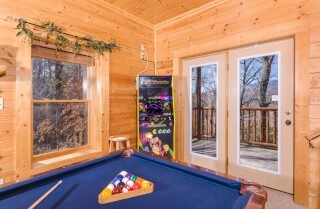 Challenge your siblings to an air hockey match, beat Grandpa (if you can) at pool, and take on all the arcade high scores. 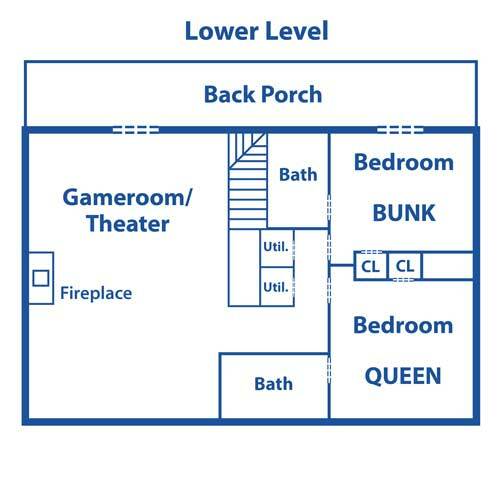 Got gamers in your group? Let them settle things on the Xbox 360 — champion chooses the DVD for movie night on the 65-inch flatscreen TV! And the loser fixes drinks and pops popcorn at the wet bar, harboring a mini fridge and microwave! 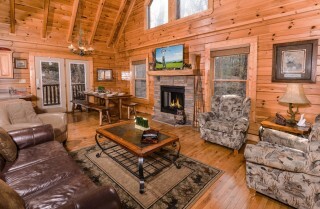 There’s even a plump sofa and an electric (no heat) fireplace to complete the space. After a day filled with fun and an evening of games, hop in the shower, slip into your softest jammies, and head to one of 5 cozy bedrooms — each with their own TV — for a restful snooze. Let the adults unwind in the 3 queen-size beds, send the kids to the twin-over-full bunk, and save the master suite’s king-size bed for yourself. 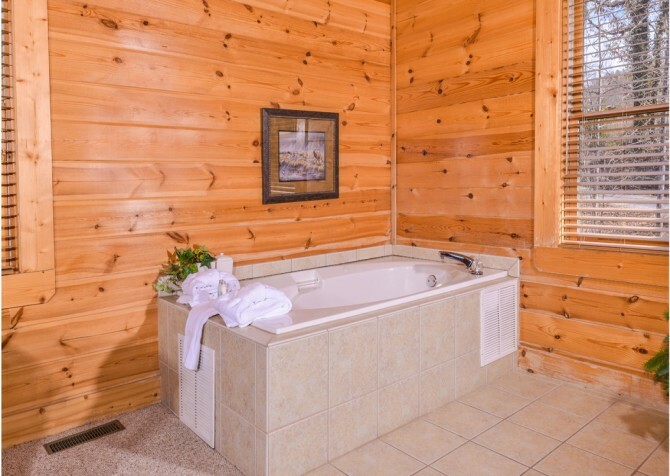 Soothe tired muscles in the private jetted tub, travel across realms with a fantasy novel in the arm chair, and cuddle with your spouse before drifting to sleep. 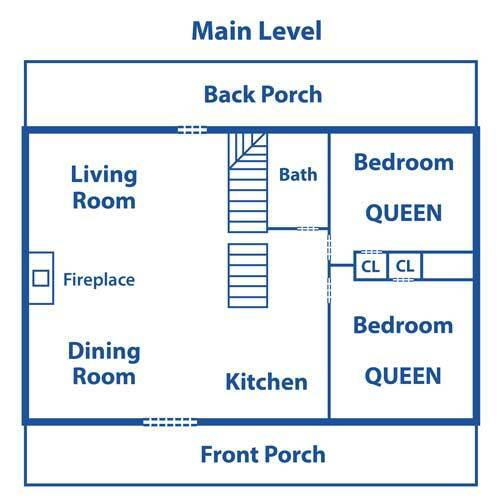 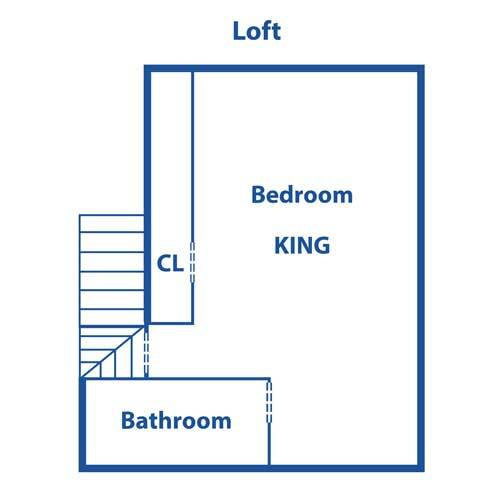 You’ll also find 2 sleepers (1 queen & 1 twin) at this large-group cabin for any additional guests you may have. After painting the town red, you and your guests can come back to your home away from home, put on your swimsuits, and hop in the large hot tub on the covered deck. 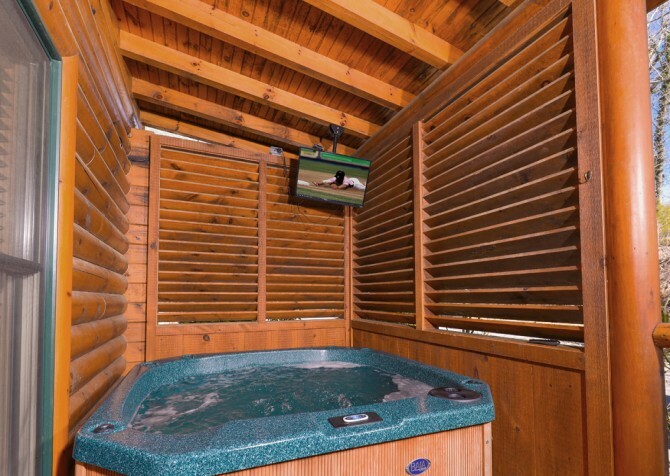 While relaxing in the hot tub, you can catch up on your favorite TV shows or the latest news with the mounted 32-inch flatscreen TV! 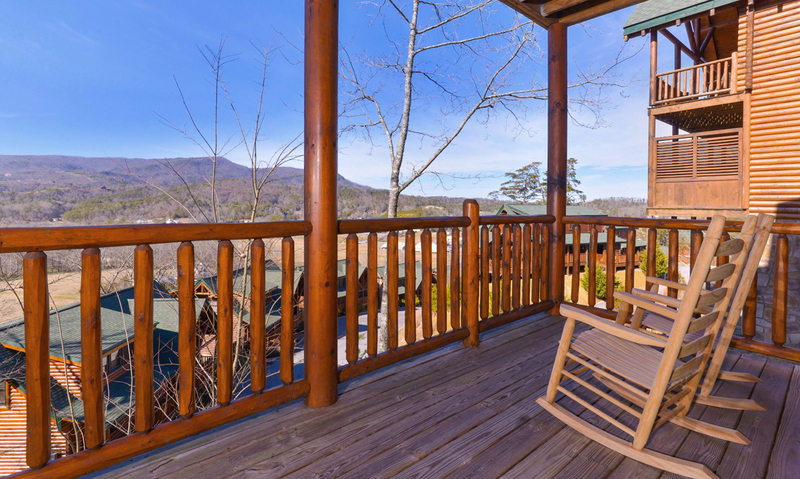 There’s also plenty of seating for everyone in your party to enjoy the great outdoors and fresh mountain air, including rocking chairs, a porch swing, and small tables with chairs. And what better to go with a stunning mountain view than a barbecue feast straight from the charcoal grill?! Perhaps best of all, this semi-private, large-group cabin boasts ample paved parking for 5-6 vehicles — even a small bus could park nicely! 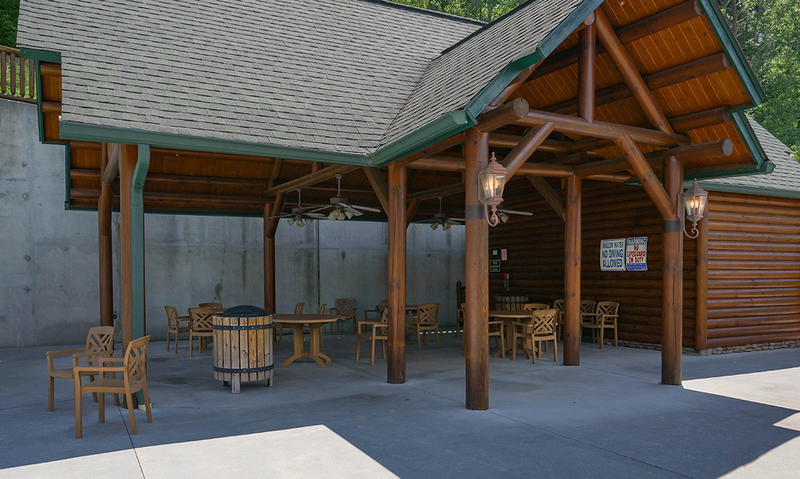 The driveway is also flat and paved to make the ride more comfortable, meaning heading to and from town won’t be a hassle. And at only 2 steps to enter the home, unloading and packing the cars will be a Smoky Mountain breeze…see what we did there? Oh, and bikers are more than welcome as Papa Bear Lodge is also motorcycle friendly! 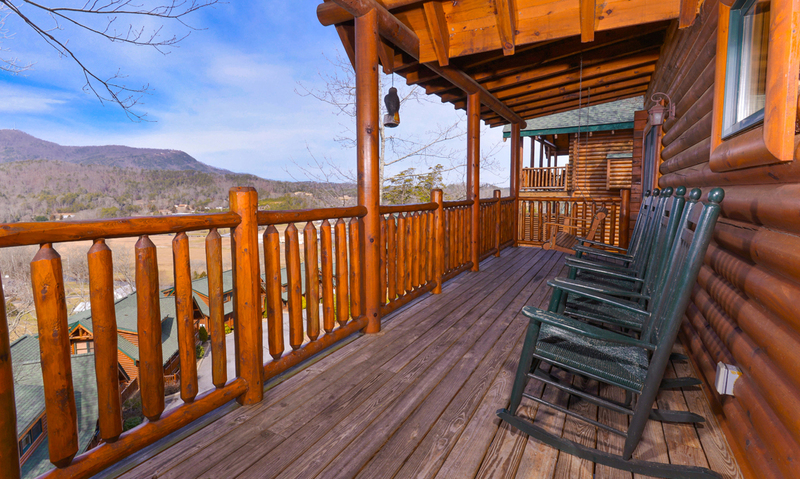 Sitting at the top of Covered Bridge Resort, you’ll feel like you’re among the clouds at Papa Bear Lodge. Plus, this large-group cabin offers homey amenities, such as a washer and dryer to clean clothes after a day of hiking, biking, and horseback riding as well as high-speed wireless internet to stream all your must-see shows. 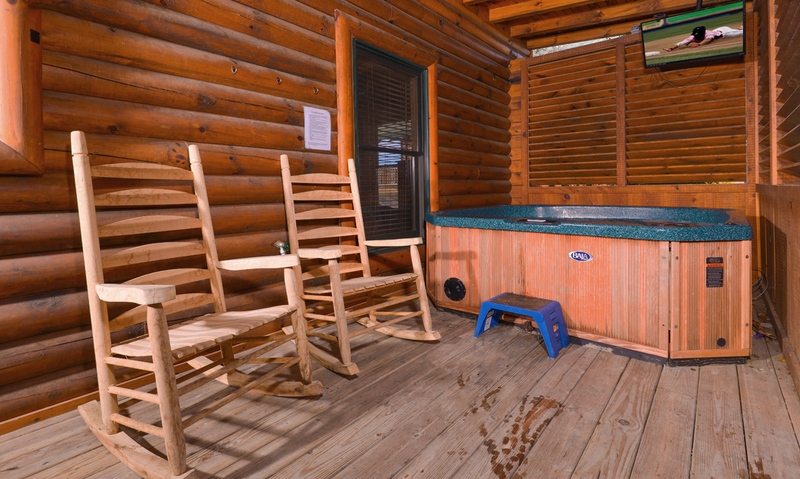 While these amenities are quite attractive indeed, maybe your main concern is bringing your pet along for vacation. 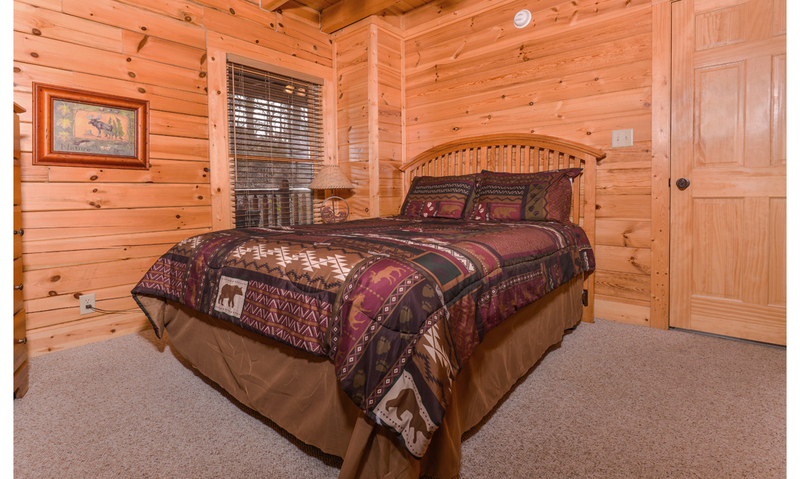 And that’s the best part — Papa Bear Lodge is a pet-friendly property! 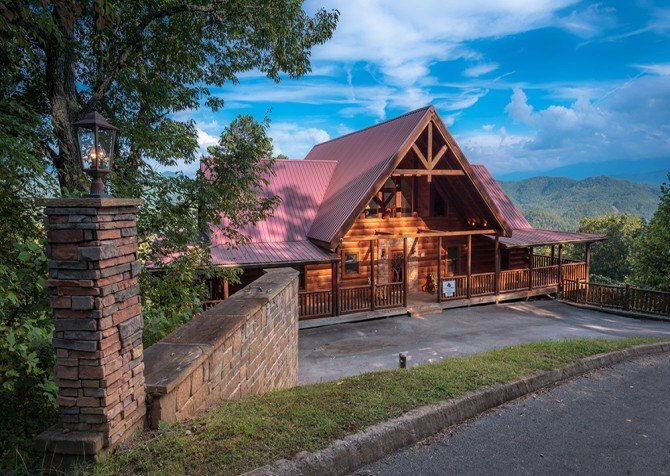 Bring your precious puppy or puppies (with a 2-pet limit at 25 pounds each) to experience the magic of the Smoky Mountains with fresh smells, intriguing sounds, and never-before-seen sights all around. 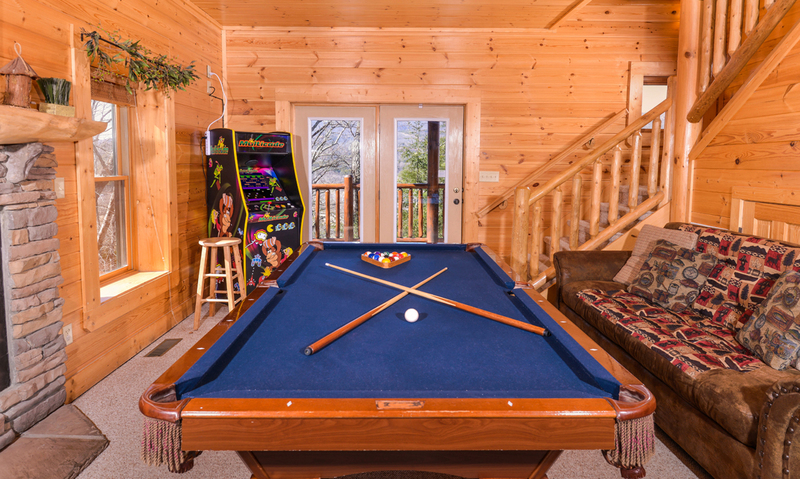 Located just over 4 miles from downtown Pigeon Forge, a stay at Papa Bear Lodge means you and your guests are never far away from exciting attractions and local entertainment. 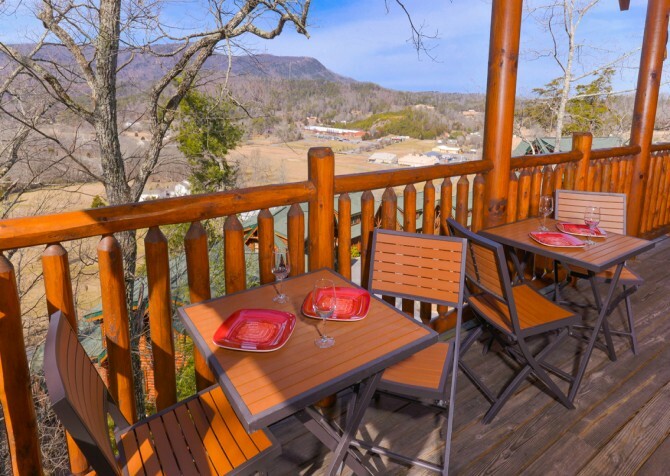 Spend days shopping with the girls, riding roller coasters at Dollywood, hiking through the Great Smoky Mountains National Park, or watching one of the many dinner shows downtown has to offer. No matter what the day brings, downtown fun is just a short drive away! It’s time to shop for Smoky Mountain souvenirs, new home décor, jewelry pieces, and precious keepsakes at Aunt Debbie’s Country Store. 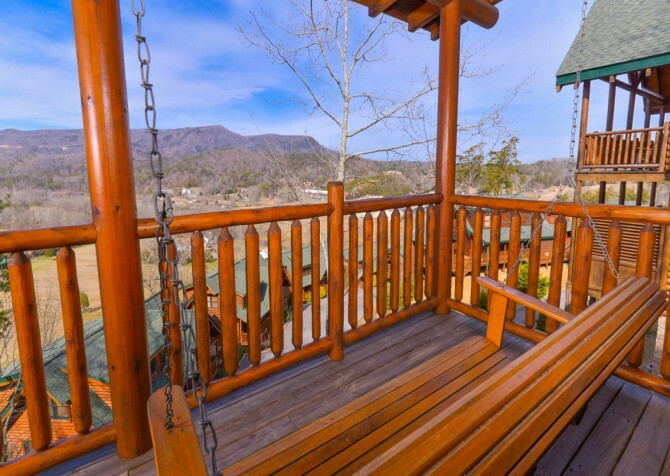 Dare to soar up to 250 feet above the ground and between towering trees over 1.5 miles at Wears Valley Zipline Adventures, where conquering your fear of heights is fun, not scary…most of the time. 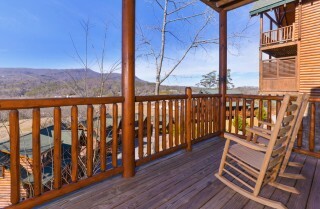 Featuring tons of unique boutiques, flavorful eateries, and the Great Smoky Mountain Wheel, there’s no better place for shopping, eating, and playing all day than The Island! "We stayed at the papa bear for 6 day's and 6 nights had a great stay. Every call we made was handled right away, everything we needed was provided, our 85 year old mother with dementia had what we feel was a great birthday week at papa bear lodge; memories were made. 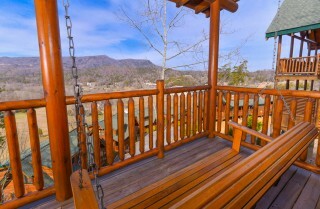 The view is fantastic from the balcony, my family will definitely be back, pray mom is with us. Thank you, Cabins For You!"